Roasting the grape tomatoes with balsamic gives them an amazing sweet yet somehow tart flavor completely waking up your everyday pasta. Add in a punch of fresh thyme and basil for a quick, healthy and fresh lunch or dinner. 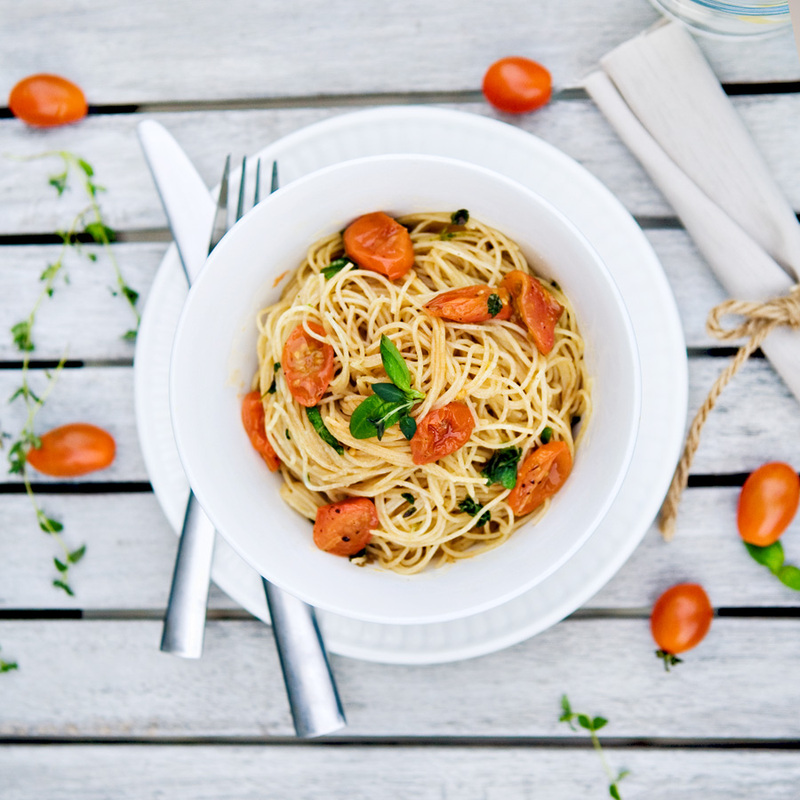 If you or your family are not yet used to whole wheat pasta, using angel hair or capellini, it cooks in only 2 minutes and the wheat-i-ness is much less noticeable. I also like to use different vinegars, I used a fig infused white balsamic today, but use regular balsamic or experiment with your favorite flavors. preheat oven to 400 degrees. toss tomatoes with olive oil and sprinkle with salt and pepper. roast for 12 minutes, remove and toss with 2 tablespoons vinegar. roast an additional 5-7 minutes. prepare pasta according to package directions, drain and toss with tomatoes, juice from pan, fresh herbs, 2 tablespoons olive oil. add additional salt, pepper and vinegar to taste. Roasted grape tomatoes are one of my faves. I’ve never tried them with balsamic vinegar, so thank you for the idea! Your blog is so cute, thank you for the wonderful vegan recipe ideas!